MANILA, Philippines - President Rodrigo Roa Duterte reports to his 'boss', the Filipinos, today, July 24, 2017 for his second State of the Nation Address (SONA) to highlight past achievements, present situation and announce future prospects of his administration. President Duterte's SONA with the theme "A Comfortable Life for All" tackled the administration's three key agenda—prosperity for all, law and order, and peace—which categorized the positive changes felt by the people. For the first time in recent Philippine history, the President also submitted his proposed 2018 national budget, worth P3.767-trillion, on the day of the SONA itself, with the biggest chunk allotted for education, infrastructure development, and health care. 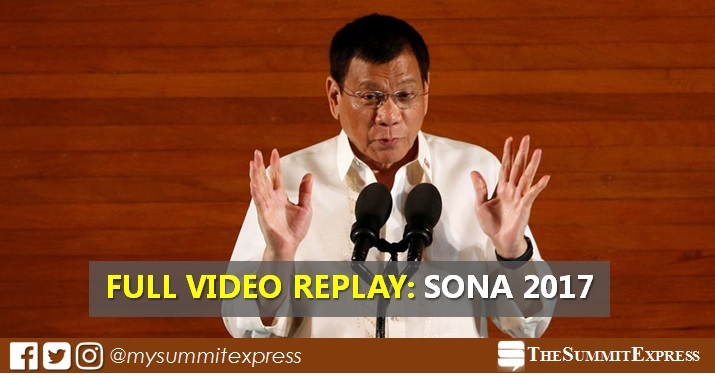 The full video replay of SONA 2017 is up and available online courtesy of Presidential Communications Operations Office (PCOO) - RTVM YouTube channel. WATCH: Here's the full video replay of President Rodrigo Duterte's second State of the Nation Address (SONA) delivered on Monday, July 24, 2017 at the Batasan Pambansa, Quezon City. Meanwhile, a technical report titled "President's Report to the People" to include the full text or transcript of speech will be uploaded online, while printed copies of the same report will be distributed to selected schools, embassies, government offices, and other institutions following the event.